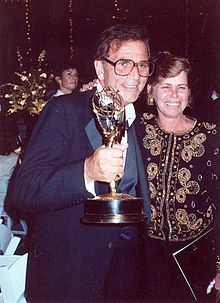 Alex Rocco at the 1990 Annual Emmy Awards, September 16. Alessandro Federico Petricone, Jr. (February 29, 1936 – July 18, 2015), known professionally as Alex Rocco, was an American actor. Often cast as a villain, he is best known for his portrayal of Moe Greene in The Godfather and his Primetime Emmy Award for Supporting Actor in a Comedy for The Famous Teddy Z. He did a significant amount of voice-over work later in his career, and was known for his gravelly voice. Rocco was a member of the Bahá'í Faith. Rocco was born as Alessandro Federico Petricone, Jr. in Cambridge, Massachusetts in 1936, but raised in nearby Somerville, the son of an Italian immigrant, Mary (née DiBiase; 1909–1978) and Alessandro Sam Petricone (1896-1949), a native of Gaeta, Italy. He first worked as a bartender in Santa Monica, California and took acting lessons from actor Leonard Nimoy, a fellow Boston native. Nimoy was not impressed with Rocco's heavy Boston accent and told him to take speech lessons. Rocco followed through with Nimoy's instructions and after ridding himself of the accent came back to study under Nimoy and character actor and teacher Jeff Corey. Rocco played the part of Moe Greene, a Las Vegas casino owner, in the film The Godfather. Greene's character represented the top Jewish mobster in Las Vegas; although he sought an Italian role, director Francis Ford Coppola remarked "I got my Jew!" on seeing Rocco. Other notable films in which Rocco appeared include The Wedding Planner, as Salvatore and (uncredited) Smokin' Aces. In the film That Thing You Do!, Rocco played Sol Siler, the founder of Playtone Records. In the fall of 1975, Rocco starred in the role of Pete Karras, a widowed father, writer, and photographer, in a 12-week CBS drama series Three for the Road, with Vincent Van Patten as his older son, John Karras, and Leif Garrett as his younger son, Endy Karras. After the death of their wife and mother, the Karrases sell their house, buy a recreational vehicle, and roam throughout the United States. He played Charlie Polniaczek, Jo's father on The Facts of Life. In 1989, he played Gus Keller in the Corey Feldman and Corey Haim movie Dream a Little Dream. From 1989–90, Rocco was a regular on the television comedy series The Famous Teddy Z as "Al Floss", a Hollywood talent agent. He received an Emmy Award as Best Supporting Actor in a Comedy Series for this role in 1990. In 1997, he appeared (along with Rodney Dangerfield) in the annual Thanksgiving episode of the ABC sitcom Home Improvement. Rocco also had a recurring part in the long-running animated series The Simpsons as the head of Itchy and Scratchy Studios, Roger Meyers Jr. In DVD commentaries, Rocco expressed true gratitude to The Simpsons' staff for allowing him his first voice-over role. He did further voice work on two early episodes of another Fox sitcom, Family Guy. Rocco did a voiceover on the 1998 Disney/Pixar film A Bug's Life, deeming it his "greatest prize in life" as he was paid $1 million to record eight lines. In 2008, he starred in Audi's Super Bowl commercial for the Audi R8 supercar. The commercial was inspired by one of the films Rocco was in: The Godfather. He played a rich man who finds the front fascia of his luxury car in his bed, a nod to the scene from the original movie in which Jack Woltz, a rich movie producer, finds the head of his prized racehorse in his bed. He was also featured on the Starz cable channel's crime-drama series, Magic City. After moving to Los Angeles, Rocco became a member of the Bahá'í Faith, and he appeared in a number of productions related to the religion over the years. He also thanked Bahá'u'lláh in his Emmy Award acceptance speech. His first marriage was to Grace Petricone, and they had one daughter, Maryann. After moving to California, he married Sandra Elaine Rocco (September 1, 1942 – June 12, 2002) on March 24, 1964. He adopted her son, Marc King, who became known as Marc Rocco (June 19, 1962 – May 1, 2009), a film producer, screenwriter, and director. The couple had two children, a daughter Jennifer and a son, Lucien, and one grandson. Sandra Rocco died of cancer, aged 59. Rocco remarried, to Shannon Wilcox on October 15, 2005. Alex Rocco died on July 18, 2015 from pancreatic cancer in Studio City, Los Angeles, at the age of 79. 1974 Freebie and the Bean D.A. 1967 Batman Block Episodes: "A Piece of Action" and "Batman's Satisfaction"
1971 Mission:Impossible Tanner Season 6 Episode 10 - "Blues"
1984 St. Elsewhere Roger Episode: "Breathless"
1985 The Golden Girls Glen O'Brien Episode: "That Was No Lady"
1985 The A-Team Sonny Monroe Episode: "Champ!" 1986 Murder, She Wrote Bert Yardley Episode: "Christopher Bundy - Died on Sunday"
1995 Can't Hurry Love Michael O'Donnell Episode: "Daddy's Girl"
1996 Pinky and the Brain Floyd Nesbit Episode: "Fly"
1996 Mad About You Mark Slotkin Episode: "Outbreak"
1996 The Simpsons Roger Meyers, Jr. Episode: "The Day the Violence Died"
1997 Early Edition Barney Kadison Episode: "Home"
1997 The Simpsons Roger Meyers, Jr. Episode: "The Itchy & Scratchy & Poochie Show"
1999 Family Guy Soccer Mom Episode: "Mind Over Murder"
1999 Sabrina The Teenage Witch TV Executive Episode: "Sabrina's Real World"
2000 Walker, Texas Ranger Johnny "Giovanni Rossini" Rose Episodes: "Wedding Bells"
Episode: "Ready, Willing and Disabled"
2005 ER Martin Trudeau Episode: "Two Ships"
2007 The Wedding Bells Larry Herschfield Episode: "The Fantasy"
2010 Party Down Howard Greengold Episode: "Constance Carmel Wedding"
2012 Private Practice Ed Episode: "Aftershock"
2015 Maron David Rosen Episode: "Stroke of Luck"
^ a b c d Mike Barnes. "Alex Rocco Dead: 'Godfather' Actor Was 79". The Hollywood Reporter. Retrieved July 20, 2015. ^ Obituary, cbsnews.com; accessed July 20, 2015. ^ Ancestry. "Massachusetts, State and Federal Naturalization Records, 1798-1950". Retrieved October 8, 2018. ^ Ancestry. "U.S., Social Security Applications and Claims Index, 1936-2007". Retrieved October 8, 2018. ^ "Alex Rocco profile at". FilmReference.com. ^ Chozick, Amy (March 30, 2012). "Old Miami Beach: Sun, Schmaltz, Murder". The New York Times. ^ Teresa, Vincent. "My Life in the Mafia." ^ Carr, Howie. "Alexander (Bobo) Petricone". BostonHitman.com. Retrieved April 13, 2012. ^ Kimball, George. "Looking Back At An Unlikely Acquaintance With Whitey Bulger". WBUR. Retrieved September 2, 2011. ^ Carr, Howie. "George V. Higgins' Eddie Coyle: Even Better than True". CriminalElement.com. Archived from the original on May 5, 2012. Retrieved April 13, 2012. ^ "Three for the Road". Internet Movie Data Base. Retrieved March 16, 2011. ^ Steve Hall. "Audi's Godfather Ad Powerful, Stellar, Captivating". adrants.com. Retrieved July 19, 2015. ^ "Alex Rocco profile at". Fandango.com. Retrieved July 19, 2015. ^ Marilyn Beck (September 11, 1975). "Actor Alex Rocco says he's indebted to Bahai teachings". The San Bernardino County Sun. San Bernardino, California. p. 39. Retrieved July 20, 2015. ^ Alex Rocco (1970s). Introduction to the Baha'i Faith featuring Alex Rocco (Video). National Spiritual Assembly of the Bahá'ís of the United States. ^ Doug Cameron, Alex Rocco (1980s). Mona with the Children (Music video). ^ Devon Grundy, Alex Rocco, Eva La Rue… (2009). Armed (Music video). Justin Baldoni. ^ Alex Rocco (September 16, 1990). Alex Rocco Emmy acceptance speech (video). emmys.com. ^ "RootsWeb: Database Index". ancestry.com. Retrieved July 19, 2015. ^ McLellan, Dennis (May 29, 2009). "Marc Rocco dies at 46; filmmaker directed 'Where the Day Takes You'". Los Angeles Times. ^ Obituary for Sandra Rocco, uga.edu; accessed July 20, 2015. Wikimedia Commons has media related to Alex Rocco.